At DBS, we are proud to offer a wide variety of basement waterproofing solutions, including drainage systems, wall products, and sump pumps. We also provide additional add-ons to these systems that ensure you will have the best protection from a basement flood available. 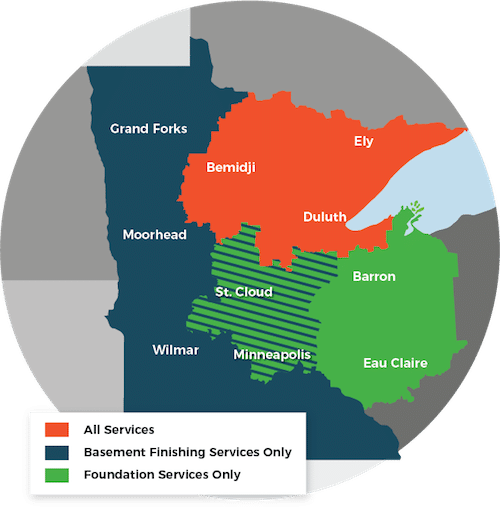 Call us today at 1-855-259-9625 or click below to get a free estimate on all our basement waterproofing products in Superior, Duluth, Minneapolis and the nearby areas in Minnesota and Wisconsin. If you want to put an end to water problems in your basement, call the local experts at DBS today! Our complete line of waterproofing solutions and products will ensure that you have a dry, clean basement. We offer free estimates on all our services in Superior, Duluth, Minneapolis, Two Harbors, Cloquet, St. Paul, Hermantown, Virginia, Ashland, Esko and throughout the surrounding areas.